Capsule Hotel Bali - New Seminyak i Seminyak, Indonesia: Bestill nå! Come join us for our Free Family Dinners Monday through Saturday. Our chef prepares a different cuisine made with comfort in mind, to have a good base so the drinks may flow! Sunday evening we will continue hosting the infamous Single Fin party bus to Uluwatu!!!!! Make sure to message us for more information and get a spot reserved on the buses before they run out! 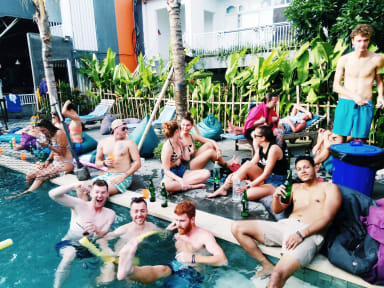 We provide the cheapest beers in Bali! As well as cheap cocktails, daily drink deals and challenges, beer pong/flip cup/slap cup/relay-chug table and the legendary Sunday Session party bus to Single Fin. If you are staying with us on a Sunday it’s not to be missed! If you fancy a night off from partying we also have popular common room with beanbags, sofas and over 100 films to choose from. Plus you can eat quality, delicious food at backpacker prices every day from our kitchen or you can make use of our fully equipped free guest kitchen. And lastly our International staff will be able to recommend you the best spots to eat, drink, party, surf, explore, ride, see and experience. No doubt you will arrive as our guest and leave as our friend! We are Open-air hostel, please use your sandal. Except in 1st Floor where we put the sign “take off your shoes or sandals” (TV lounge area). Airport Pick Up: We can help you to arrange an airport pick up for IDR 180K /vehicle (with third party provider). A car can fit up to 5 people. There will be an extra charges IDR 50K if from midnight until 6am. Please inform us 1 day in advance if you need it. Our facilities include a fully operational bar and kitchen as well as a fully equipped separate kitchen for guests use. We also have a common room with Cable TV and over a 100 free DVDs, communal board games, cards against humanity, a motorbike parking area, air conditioning in every room, universal plugs and a reading light for every bed (no more chunky adaptors), two comfy pillows for every bed, a book exchange, a secret rooftop terrace, the “Tower of Power” and free, communal; hairdryers, iron, guitar and ukulele! We have a range of dorms to suit a range of needs from 14 bed dorms to private rooms. Every bed has in the hostel has TWO plump comfy pillows, a high quality mattress + duvet (not blanket) to ensure you get a great night sleep, as well as a reading light and a plug socket. This place is better than any other place i have been to. The cleaning is vert good. Food and drinks is cheap and is served fast, not to mention the free dinner!!! The people working here is young and cool: s/o Rara ❤️ They make sure you have a pleasent stay for sure. If i come back, i will check inn to this please for sure!! Had a great stay at capsule. Perfect place to meet other solo travelers! The rooms were clean and cool. Would definitely recommend to stay here. Nice roms, with some privacy because you sleep in a "capsule". Big lounge upstairs. Good storage for backpacks. The lock in our room didn't work so everyone could walk in.